← Thinking of Submitting to Quarter-Life? Read This! 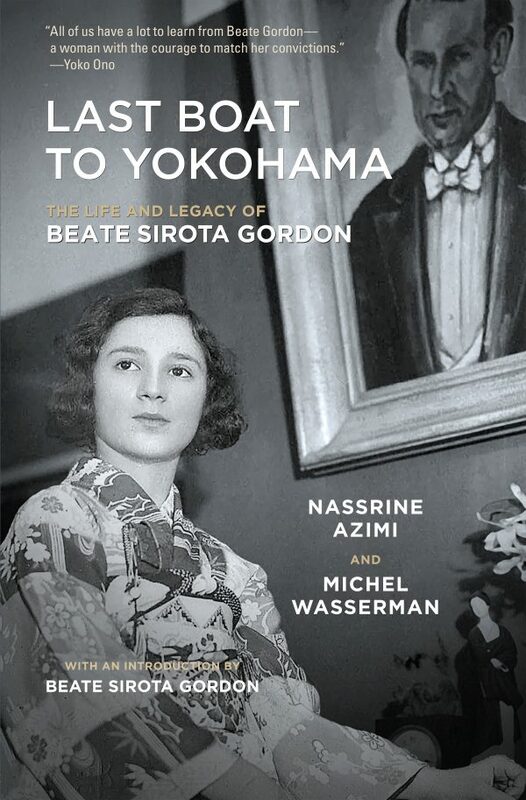 Join us at the Cornelia Street Cafe at 6 p.m., Tuesday, May 19 for the inaugural NYC launch of Last Boat to Yokohama: The Life and Legacy of Beate Sirota Gordon! We at Three Rooms are so super excited about this book, and we can’t wait to share it with you! The event will include readings by authors Nassrine Azimi and Michel Wasserman (both direct from Japan – just for you! ), plus special guests. We’ll have plenty of books available for purchase, and the authors will be doing signings. We hope to see you there! For more information about the event, email info@threeroomspress.com and keep checking back in with us on Facebook. Tragedy and brilliance alternate throughout LAST BOAT TO YOKOHAMA: The Life and Legacy of Beate Sirota Gordon (Three Rooms Press Trade Paperback Original; May 15, 2015; $15.95), the fascinating biography of Beate Sirota Gordon, by Nassrine Azimi and Michel Wasserman. Beate secretly helped draft Japan’s post-WWII constitution—framing an article that required equal rights for women—then devoted the rest of her life to introducing hundreds of brilliant Asian performers and artists to America. In 1946, a remarkable woman secretly helped create Japan’s new constitution, writing a clause that mandated equal rights for all women in Japan. Few could imagine that Article 24 was the work of a then twenty-two-year-old European-born American of Ukrainian descent who had grown up in Japan. Her name was Beate Sirota, and she remains an idol for generations of Japanese women to this day. In the United States, she is responsible for introducing hundreds of previously-unknown Asian performers and artists to the American public for almost four decades. LAST BOAT TO YOKOHAMA includes a foreword by Beate written before her death in 2012, an in-depth look at her father, world-renowned classical pianist Leo Sirota, personal diaries from the World War II era by her mother, Augustine, as well as a detailed overview of her life, the effect of Article 24, and her impact on culture through her dedication to introducing authentic music of the Far East to American audiences. Nassrine Azimi has co-founded and now coordinates the Green Legacy Hiroshima (GLH) Initiative, a global campaign to plant seeds and saplings of trees that survived the atomic bombing of Hiroshima throughout the world. She established the Hiroshima Office for Asia and the Pacific, United Nations Institute for Training and Research (UNITAR) in 2003, becoming its first director until 2009. Azimi has written and published extensively on UN peacekeeping, post-conflict reconstruction, and environmental governance. She lives in Hiroshima, Japan. Michel Wasserman is the former director of the Kyoto French Cultural Institute and of a French “artist in residence” program in Kyoto, the Villa Kujoyama. He is currently professor at the College of International Relations, Ritsumeikan University. A Paris III doctor in oriental studies, Michel Wasserman has worked and written extensively on Japanese traditional theatre, especially Kabuki, and has also published various books on the reception of western music in Japan. He lives in Kyoto, Japan.